The Internet is pretty much overrun with “life hacks”, especially hacks that have to do with eggs. So while the impressive party trick hacks do have their place, my favorite kind of hack is one that makes life easier. 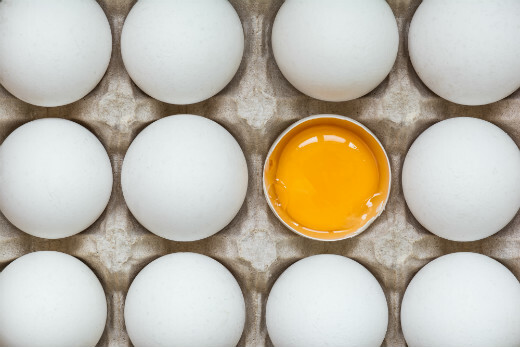 Not only will these 7 egg hacks yield you impressive results, they’ll save you time, too. A regular pan-fried omelet seems so innocent. So why does it always leave my kitchen a disaster zone? With the frying and the flipping, omelets can make for major cleanup. So why not test out this omelet in a bag? 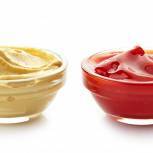 While this quick-cleanup recipe is known for its convenience while camping, kosher consumers can take advantage of this hack while traveling. Another benefit of these omelets is that you can make a few of them in one pot, which means breakfast will be ready for everyone at once. Note: When attempting this recipe, be sure to use a heavy-duty plastic steaming bags that are labeled as safe to use in cooking. 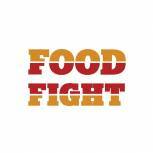 Looking for an insanely easy way to feed a crowd? Bake eggs in a sheet pan for quick one-pan omelets. This brunch-perfect recipe allows you to easily keep the eggs warm till you’re ready to serve, plus you can cut them into neat squares — or cookie-cutter shapes — which look fantastic on a platter. A genius way to cleanly separate egg yolks from egg whites: use a plastic water bottle as a suction-and-release device! Though I wouldn’t use this egg separator hack if I needed just a couple of egg yolks, I could see this coming in handy when you need to separate a dozen or more eggs, like for homemade mousse, ice cream, and sponge cakes. The best part? You can hand this task over to your kids, who will love extracting the yolks with this crazy-fun hack. I’ve heard lots of tips on how to get the perfect hard-boiled eggs: get the eggs to room temperature, add salt/baking powder/vinegar to the cooking water, soak them in ice water after cooking. And all these tips are great! BUT, for the most foolproof perfect-eggs-EVERY-time, I’ve found the best solution are eggs steamed in the Instant Pot. Because the Instant Pot calibrates the perfect pressure automatically, all you need to do is set the timer right. No watching the pot, no risk of over- or under-cooking the eggs, AND the pressure of the cooker ensures the peels will slide right off every single time. If you don’t have the Instant Pot, you can achieve the same easy-to-peel results by cooking the eggs in a steamer basket. These bell pepper eggs are a gorgeous hack that’ll amp up your basic egg recipe. The bell pepper ring acts as a colorful frame for each egg, creating a pretty flower-like shape. 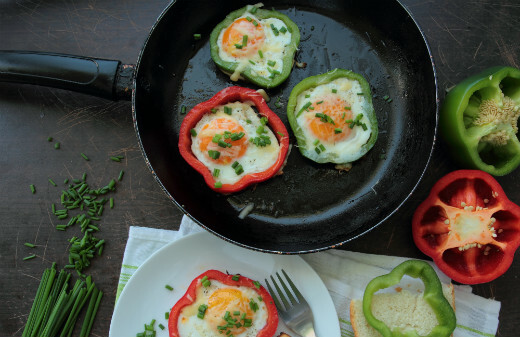 Variation: Instead of bell peppers, you can cook the egg inside an onion ring! For an extra level of tastiness, before cooking the eggs, dredge the onion rings in flour and fry. 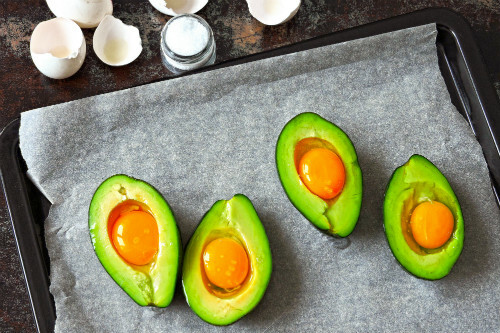 Halved avocados + eggs + an endless amount of toppings = a very chic way to serve eggs. Just add some whole grain seeded toast for a complete (and totally Instagrammable) breakfast. This 4-minute scrambled egg hack is by no means glamorous, but it sure gets the job done. Just like those microwave cake-in-a-mug recipes, nuking eggs is not the ideal way to cook ‘em, but it works. You’ll be grateful for this hack when you’re traveling, turning over your kitchen for Pesach, or just too bone-tired to think of using a pan.